"Outstanding Production For Young Audiences"
Jasp has decided to write a book about ‘going green’ so that she can become a famous author. There is only one problem: she doesn’t know anything about what ‘going green’ really means. When her sister Morro jumps in, the two decide that they need the help of Dr. David Suzuki. A letter from him soon arrives and the clown duo embarks on a journey to reduce their ecological footprint. Together, they struggle to learn how they can make changes in their daily lives and learn that, although not always easy, being environmentally friendly is certainly important and curiously rewarding. 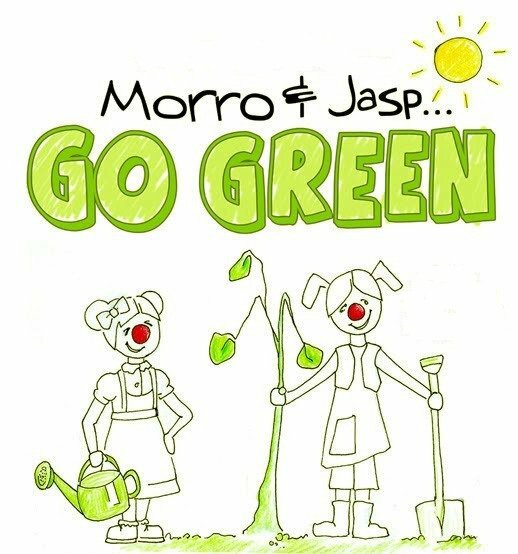 An engaging and entertaining look at being environmentally friendly, Morro and Jasp GO GREEN turns assumptions about going green on their heads and teaches us that every little bit makes a difference. Explored by the loveable and highly laughable Morro and Jasp, the messages hit home for both kids and adults like never before. "Outstanding Production for Young Audiences" and "Outstanding Ensemble"